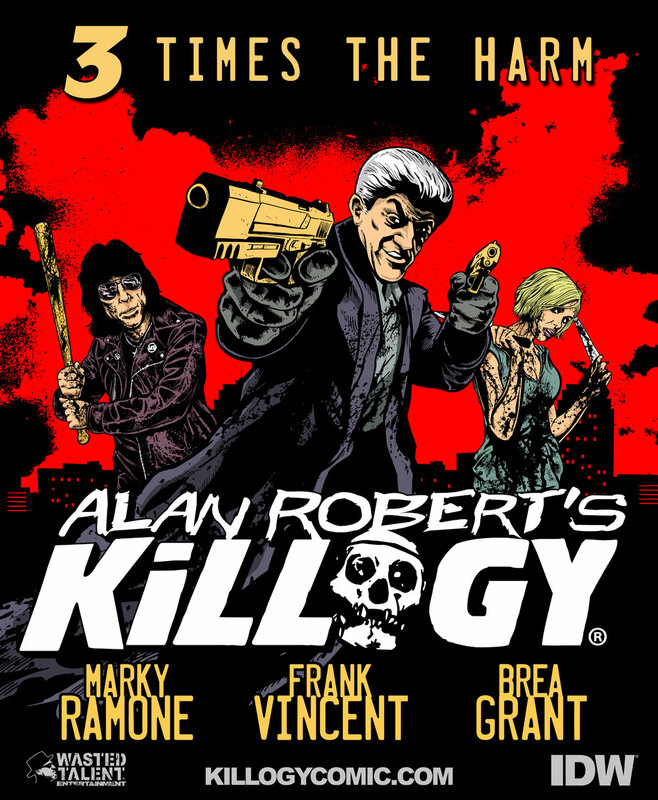 AICN COMICS Q&@: Ambush Bug talks with Alan Robert’s new horror comic KILLOGY starring GOODFELLAS’ Frank Vincent, Marky Ramone, and Brea Grant!!! AMBUSH BUG (BUG): All right, well I am here again with Alan Robert and you have kind of surprised me with a couple of your previews books, like WIRE HANGERS and the most recent one, which was CRAWL TO ME, is that correct? BUG: You have a new project coming out today. So what’s going on with you? 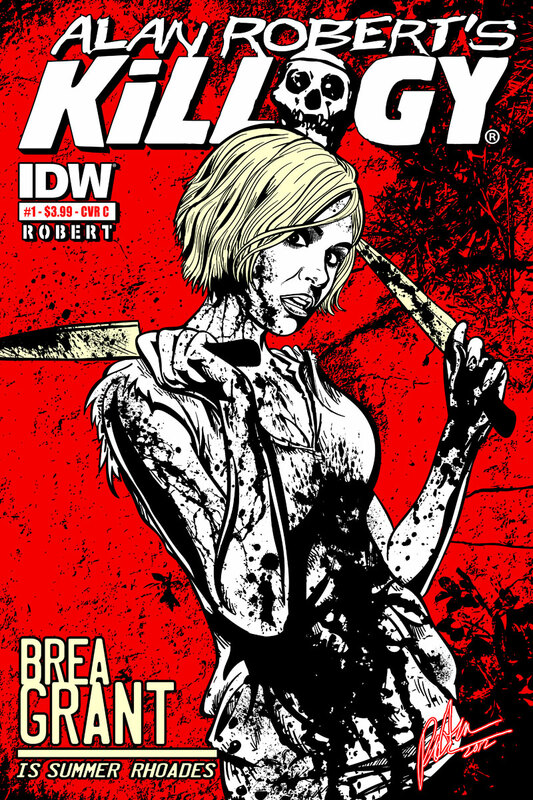 AR: Well it’s a new series called KILLOGY and it comes out through IDW in October. BUG: Very cool, and so what’s the premise of the book? AR: Well, it follows these three unique characters that have intertwining paths, and the interesting thing is that the characters are based on real life celebrities. Frank Vincent from GOODFELLAS, Marky Ramone from The Ramones, and Brea Grant from DEXTER and HEROES. BUG: Cool, very cool. So what was it about those three celebrities in particular that made you want to write about those guys? AR: Well it’s just coming up with the characters. One’s a mobster, one’s like this New York character, and the other is a rock star, and the other is an up and coming actress. I don’t know, I just visualized them while creating the story and associated them with these celebrities and every time I was at the drawing board they would come out looking similar to these real life celebrities, so somewhere during the process I reached out to them to see if I could get the rights to use their likenesses in the book and they were all game, so here we are a couple of months later and those images are out there and everyone is really excited to be a part of it. BUG: So what kind of license do you have to have? I know that in the past IDW and places like Dark Horse have had to work with or sometimes around doing the likenesses of actual people in their books. Where there any problems getting permission to use the likenesses? AR: Yeah, you know I wasn’t going to do it if it they weren’t into the idea obviously, and so I approached them all and basically offered them a deal to be a part of this project and they all signed on. BUG: So did you know these people before hand? AR: Just through mutual friends. 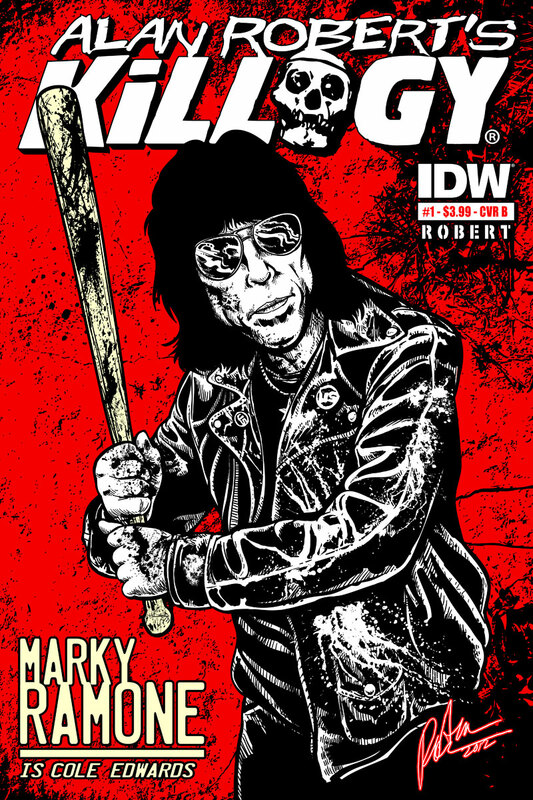 You know, my production partner on the CRAWL TO ME movie is an old friend of Frank Vincent, so he connected us and Brea had done a book called WE WILL BURY YOU through IDW, so they connected us and one of my old friends who was with the same record label as Life of Agony and connected me with Marky Ramone. 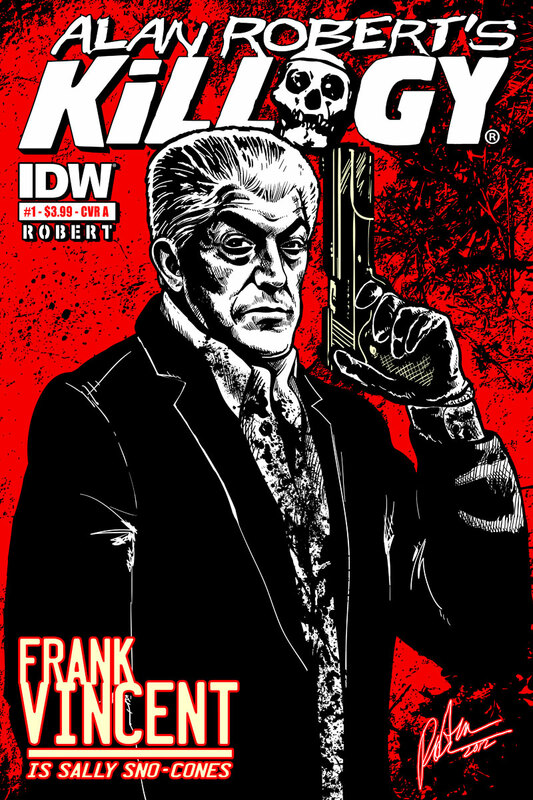 AR: Yeah, well it’s definitely a book that…I don’t want to give too much away, but basically the Frank Vincent character is a mob hit man who is turned over to the feds by his former don and he’s got to get rid of all of the bodies that he’s been collecting before he’s given up and so those victims come back to haunt him, let’s just say. AR: And each one of these stories has something to do with the others, so Marky Ramone’s story involves a heist, a diamond heist, and one of the elements of the jewels is connected to an evil entity. So things like that. BUG: Okay, very cool. So how many issues are we looking at here for this miniseries? AR: It’s going to be a four issue series and it’s going to start monthly in October. BUG: Okay, and you mentioned CRAWL TO ME. How is it gong with that film? AR: It’s going really well. We recently signed on some screenwriters and we are finally at the stage where the treatment is approved and the directors are giving it a once over and then they are going to go dive deep into the screenplay. We should have a first draft between eight and ten weeks. BUG: And how about WIRE HANGERS? How is that going? AR: It’s going a little slower just because the FX company that we were working with took on some other projects, so it’s kind of slowing us down a little bit, but we are still moving forward with that as well. BUG: Good. Well, back to KILLOGY. I know that you have a very distinct style of artwork in your work. 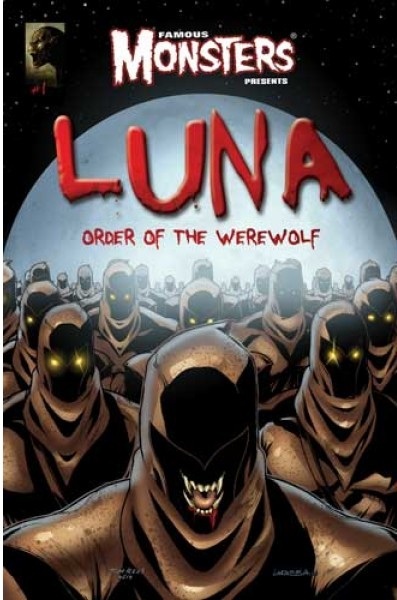 Is it going to follow the same sort of style or do you do something a little different with this book? AR: It’s actually a lot different. There are some illustrations on the KILLOGY website, and I’ve kind of abandoned the more atmospheric approach with all the linear effects, just because I didn’t think that the content was suitable for that. So I purposely changed up my style for this book and made it more graphical and so it’s a very limited palette. It’s more traditional pen and ink work and very bold. BUG: And what was that like for you, to switch up styles? Was it difficult at first? AR: I’ve been working on it the last few months. Actually, I picked up one of those Wacom digital drawing boards and so I’ve been drawing digitally for the last couple of months and that’s how I’m going to tackle this book, which is the first time I’ve done that. But it’s been great so far. It really eliminates a lot of the scanning and there’s always that point in time when you’re doing a pencil thing and you have the ink over it where you may screw it up (laughs) and you kind of eliminate that aspect when you work digitally. BUG: Yeah. Do you think that this is going to affect the way you draw from here on out? AR: I would never say that, because I’m always, like, open to new things and technology and just trying interesting things myself. I enjoy the challenge, so I say definitely for this book I want to go this route for this series, but you never know what’s going to happen. You never know what the next series is going to bring. BUG: You’ve been very successful with your own stories and your own original content that you’ve been doing. Have you ever been tempted to do another person’s character art-wise or writing-wise? AR: I’m totally open to doing that. I haven’t seen the opportunity that would give me the amount of time that I would need to do it and knock out my own stuff too, because it’s all so demanding with the other stuff I’ve got going on. Even this project was like “Wow. How am I going to get this done?” (laughs) You know, I’m always faced with that, running out of time, but I’m totally open to it. There are lots of characters that I would love to take on. BUG: Is there one in particular that you would love to do? AR: Probably PUNISHER actually, something like that. BUG: That would be awesome. AR: So you know, like Mike Zeck was always a big influence on me. BUG: Definitely. Well what else do you have going on? I know that you’re always busy. BUG: Yeah? You seem to be pretty tightly associated with IDW. It seems like they’ve been really good to you so far. AR: Yeah, I mean you can’t ask for a better bunch of guys over there and Chris Ryall and Ted Adams have really welcomed me with open arms and I couldn’t be more thankful for them. I’ll keep making books for them as long as they will have me. BUG: Great. Well, congratulations on the new series. I can’t wait to check it out in October. Is there anything else that you want to talk about today? AR: Just to let people know, if they want to see some preview artwork and some of the characters online, you can visit the KILLOGY website and there’s also a quick animated teaser up there, too. BUG: Very cool. Well, congratulations and it was great talking to you. Thanks a lot. AR: Cool. Thank you, man. 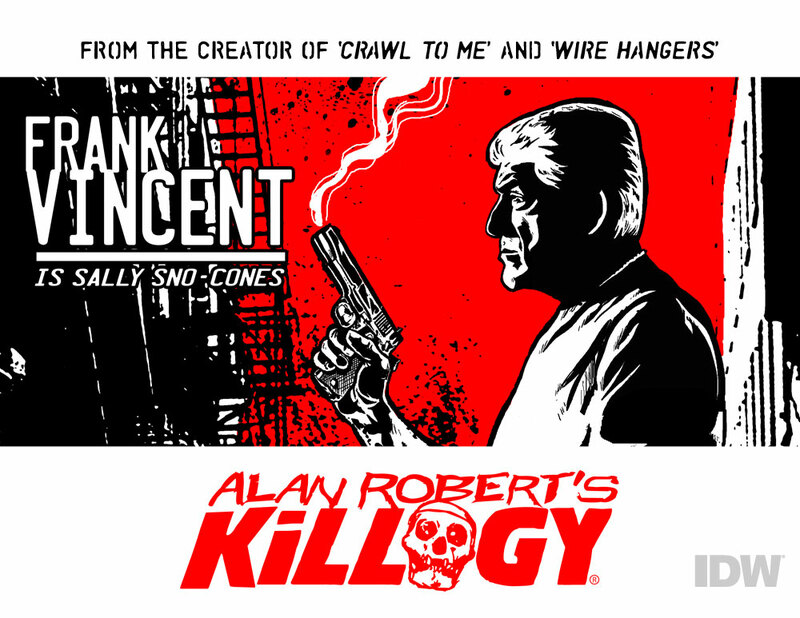 BUG: KILLOGY will be available in October through IDW Publishing! Check out the teaser trailer for KILLOGY below!